Professor Steven Glaser fixes a sensor in the American River basin. 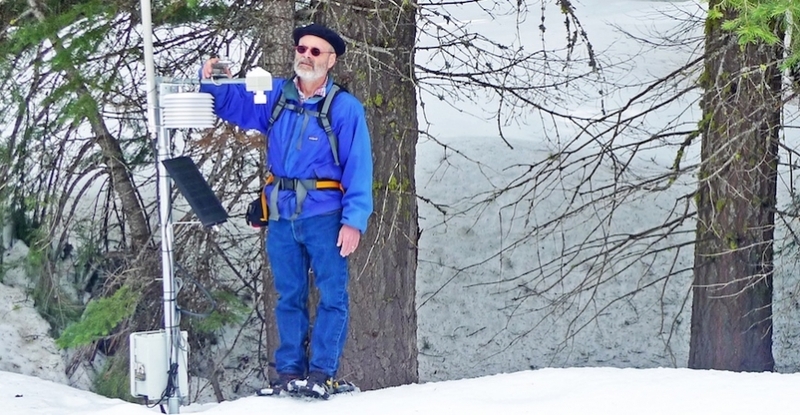 Scientists from the Sierra Nevada Research Institute, UC Merced, UC Berkeley and the USDA Agricultural Research Service have designed the first ever wireless sensor network (WSN) capable of accurately monitoring the hydrology of large mountain river basins. The new system is detailed in two papers just published in the journal Water Resource Research. Deployed and tested in the American River basin on the western slope of the Sierra Nevada, the new WSN represents a significant improvement over existing systems. It allows for vastly improved predictions of mountain water supplies, which had long been based on very limited measurements of precipitation, snowpack and water stored as soil moisture. The new WSN solves these problems. Extending across 830 of the American River basin’s 2,050 square miles and spanning elevations from 4,900 to 9,000 feet, the WSN monitors the upper 40 percent of the basin, significantly expanding the total measurement area and providing a more complete picture of the basin’s hydrologic profile. 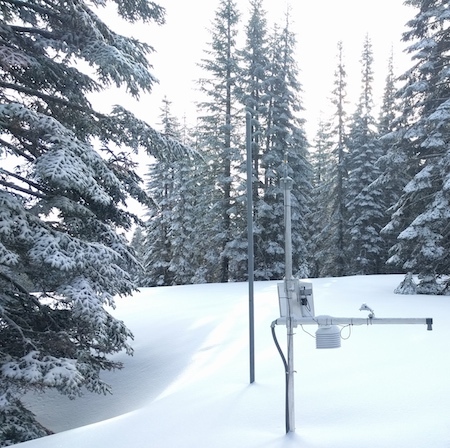 A sensor node surrounded by deep snow in the Feather River basin. Over 140 sensors are strategically distributed in 14 clusters spread throughout the basin, allowing researchers to monitor key hydrologic variables — including temperature, humidity, precipitation, snowpack, solar radiation and soil moisture — at sites that differ in elevation, direction, slope and forest density. “Better estimates of the water and energy balance across the mountain landscape are key to reducing the high uncertainty in some of the current forecasts,” said Professor Martha Conklin, who uses WSN data for experimental forecasts of streamflow. Using the WSN data, researchers found that they could estimate the elevation at which precipitation fell as rain versus snow based on dew-point temperatures measured across the basin, an estimate that could not have been made without the WSN’s system of dispersed sensors. Researchers were also able to estimate where and how much precipitation fell as rain versus snow across the basin. Surprisingly, the data revealed that mixed rain-and-snow precipitation events were far more variable than previously assumed. The WSN also provided more detailed estimates of the amount of water stored in snowpack, as well as when and where snowmelt occurred. UC Berkeley Professor Steven Glaser, who developed the WSN technology, is now working to extend it to other areas. “The WSN now being built in the Feather River basin is aimed at improving forecasts for hydropower operation,” Glaser said. UC Merced Professor Roger Bales, who leads the American River WSN project, foresees the WSN becoming an integral part of California’s next generation of water information systems, providing essential data for water resource planning. “As precipitation shifts from snow to rain and snowmelt peaks earlier in the season, largely due to the warming effects of climate change, tools and systems that provide more accurate estimates of snowpack, snowmelt and precipitation will be increasingly important,” Bales said. The National Science Foundation supported development of the WSN; current research is part of the UC Water Security and Sustainability Research Initiative. The first of the papers can be retreived here. The second paper can be retreived here.